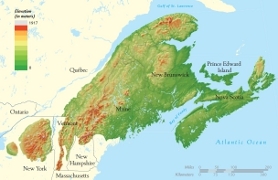 Welcome to the Northern Appalachian/Acadian Ecoregion Conservation Atlas, a project of Two Countries, One Forest (2C1Forest). The goal of the Atlas is to provide access to transboundary environmental information to land owners, land managers, landuse planners, researchers, land trusts, conservation NGOs and community groups to support the conservation and restoration of the diverse flora and fauna of this outstanding forest ecosystem, and to inform sustainable land use planning. The Atlas contains a collection of maps that can be easily customized by users and a collection of spatial datasets in GIS format that can be downloaded. Each map and dataset is accompanied by information (metadata) to support their use and interpretation, and in many cases reports and publications related to them have been attached. Maps and data have been grouped into Galleries that correspond with major projects to help users find the maps and data they need as easily and quickly as possible. With Financial support from GeoConnections, a national program initiative led by Natural Resources Canada. GeoConnections and its program participants are working to enhance the Canadian Geospatial Data Infrastructure, an on-line resource that enables decision-makers to access, combine, and apply geographic information to gain new insights into social, environmental, and economic issues. Open Space Conservancy, an affiliate of the Open Space Institute, established Saving New England's Wildlife Fund with a lead grant from the Doris Duke Charitable Foundation to protect wildlife habitat in northern New England. The ESRI Conservation Grants Program provided software support to the conservation groups that have contributed content to the Atlas. Managed by Wildlife Conservation Society Canada on behalf of Two Countries, One Forest.